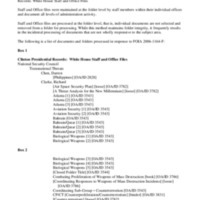 This collection consists of records dealing with terrorist attacks during the Clinton Administration and the counterterrorism policies put in place in response to those attacks. 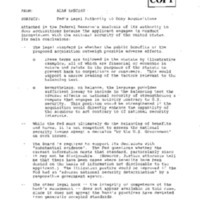 These records include press briefings following the attack on the USS Cole and memos regarding security during the 1996 Olympic Games in Atlanta. 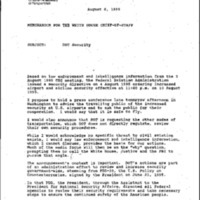 Records dealing with aviation security include the final report to the President from the White House Commission on Aviation Safety and Security dated February 12, 1997, a list of accomplishments, and press guidance on increased security measures dated August 1995.